This announcement should be big news to sailboat racers around the Pacific Northwest. Read on for my take, as well as the press release from Race Week. For another take, be sure to check out my 48° North colleague, Kurt Hoehne’s, post on the same subject at his website, www.sailish.com. After years of careful consideration, Whidbey Island Race owner, Schelleen Rathkopf, has made a decision about the future of Race Week. At this very moment, she is in the new home of Race Week – Point Roberts, WA – beginning the plans for the 2020 event in this location. This is an exciting development and, though not perfect, I believe it will be a smashing success and a net gain for sailboat racing in the PNW. It’s no secret that I love Whidbey Island Race Week. It is one the most important events of the year for its fun factor, the quality of racing, and for the ways that it strengthens the sailing community. I have served on the WIRW Advisory Board for several years; and in spite of my affinity for WIRW, I have been a pretty enthusiastic supporter of the “Leave Oak Harbor” side of the Whexit debate. I’m excited to see what this new venue can do to redefine the defining PNW racing event. Point Roberts is a beautiful location that provides the draw and the intrigue of being an entirely new race course for most attendees. More often than not, the first beat in Penn Cove was a matter of execution, not interpretation. This will not be the case for at least the first few years in Point Roberts. In fact, I don’t know anybody that has raced out of Point Roberts before, and I think that’s fun! Given the location on the northwest side of Boundary Bay, it is fair to expect more boats from Canada will join the Race Week fleet. Delivery distances are in the 30-46 nautical mile range for boats based in Vancouver, Sidney, Nanaimo, and Victoria. Not only would it be great to see the fleet grow in numbers, but I love the idea that its going to take on more of an international feel. I’ve always enjoyed my interactions with Canadian sailors over the years, and I love the idea that this event can make us all feel like a more cohesive regional sailing community. Point Roberts will be a vastly better venue for boats that are bigger and smaller than the current Race Week fleet. Exciting to me personally, considering how much time I’ve spent racing in the fleet, Point Roberts is a deep enough marina that it could accommodate the ORC fleet. Their estimated depth at a -3 tide is 11 feet. There are now five TP52s in the area (four in Seattle and one in Vancouver) plus a number of other big, fast boats with drafts too deep for Oak Harbor. It puts my stoke meter in the red to imagine a week of terrific summertime racing within that fleet. More important to the event’s success, and more likely to promote the growth and accessibility of sailing in a broader sense, Race Week can now bring dinghies back into the fold. Despite efforts from all sides, the realities of getting dinghies from Oak Harbor out to Penn Cove were untenable. Launching in Point Roberts should be easy using the boat ramp that will be installed in the marina facility before the event in 2020. There will be essentially no delivery to the race course, a key for the small boat fleet. As you will read in the Race Week press release, there are already plans in the works to tie in a youth sailing event. The local intel about the venue indicates that, similar to Penn Cove, the breeze tends to fill in the early afternoon. Any mid-summer regatta on the Salish Sea will have the risk of no-wind days, but because of its proximity to the racing area, Point Roberts should be able to facilitate shore postponements if the conditions require it. I have some fond memories of bobbing around in Penn Cove waiting for breeze, but if that becomes less of a feature of Race Week, yahtzee! As someone who has (cough) never been one of those heads-in-beds that supports the local tourism economy, the camping scene has always mattered deeply to me and my sailing buddies. Point Roberts will offer on-site camping, and there’s a full service campground nearby with electricity for RVs. The biggest compromises with Race Week in Point Roberts have to do getting there. For Seattle-based Race Week regulars, the delivery distance is roughly twice as far. It will be a haul to get up there, and I expect that the fleet will lose a few boats that are unwilling to make the trip. The gears are already turning on the idea to give the delivery crews a planned half-way stopover, which could ease the burden a bit. This distance, of course, is balanced by the closer proximity from many of the Canadian sailing hot spots. With the infrastructure to support it in the form of a 35-ton travel lift, a 3,000-pound hoist, and the boat ramp – I think growth in the dinghy and trailerable sportboat fleets is likely. Boats coming from Seattle on trailers only increase their drive time by about 45 minutes compared to Oak Harbor, but any boat coming from Washington state must now go through two border crossings to get to the venue. Over the next few years, I’ll be curious to better understand what kind of support the local Point Roberts boats and community can offer the event and attendees. The friendly volunteers and leadership at Oak Harbor Yacht Club have always gone above and beyond at Race Week, serving on the Advisory Board and helping with Race Committee, merchandise sales, food service, and support of the Kids Camp. The folks in Point Roberts have already shown gusto in partnering with Race Week, and I’m sure they will continue to be awesome, but they’ve got big shoes to fill! I’m in support of this move. While it is genuinely bittersweet considering how many fabulous memories many of us have from Whidbey Island Race Week, Oak Harbor’s challenges of depth, camping, and a broken hoist (with no plan for repair) are well known. The move to Point Roberts gives Race Week a whole lotta new: new location, new fleet make-up, new race course, and new appeal. I sincerely hope that the Race Week stalwarts won’t shy away from the longer delivery, because I think big participation and big fun is in our future. In the more immediate future, the announcement makes this summer’s trip to Oak Harbor to bang the beach in Penn Cove and raise a rum punch to Oak Harbor exponentially more special. SEATTLE, Washington, March 28, 2019 – Whidbey Island Race Week LLC is pleased to announce Point Roberts, Washington as the new venue for Race Week beginning in the year 2020. The event will be called Point Roberts Race Week and the 2020 dates will be July 13-17, 2020. Point Roberts Race Week will be a 5-day race event, Monday through Friday which allows for the weekends before and after for boat deliveries. The vision is to create the largest sailboat racing event on the west coast of North America that includes sailors from the USA and Canada. In addition to big boat and dinghy racing, race organizers also want to tie in a US Sailing National Championship as well as a youth event which the size of the venue supports. Plans have already commenced to have Point Roberts Race Week included in VARC (Vancouver Area Racing Circuit) Society in an effort to build participation from Canada. For the first year, there will be 3 race circles in 2020, each with their own US Sailing certified PRO and race committee: big boats, dinghies and a cruising class for those who want to enjoy the event with one casual distance race per day. Awards will include daily and overall awards for the top 3 finishers in each class. Additionally, Point Roberts Race Week will continue the Whidbey Island Race Week tradition with two perpetual awards that include the Philip Wise Sportsmanship Award for the crew that exhibits exemplary sportsmanship and the Molly Kool Cup Award that recognizes the overall achievement of a female skipper. Point Roberts, Washington is a beautiful seaside community that is just 4.9 square miles and overlooks the Strait of Georgia north of the San Juan Islands and south of Tsawwassen and Ladner, British Columbia. It offers a protected 920 slip marina that sits on 155 acres and can easily accommodate an influx of sailboats of all sizes and their tenders for a week every summer in July. The marina also has a 3,000-pound small boat dinghy lift in addition to a 35-ton travel lift, a full-service chandlery and mechanic shop. There is gas, diesel, propane and water available at the marina in addition to RV and tent camping, laundry and shower facilities. There is also a US customs agent on site to assist with racers coming to Point Roberts Race Week from British Columbia or other provinces in Canada. The Point Roberts Marina includes Breakwaters Bar and Grill, a full-service restaurant and bar that is fully equipped to handle 500-600 people for indoor/outdoor post-race parties on site. There is a grocery store nearby, and the marina is secure, pet friendly and has ample parking for trailers and cars. There are 1300 full time residents in Point Roberts and in the summertime, this number doubles due in large part to the number of vacation and 2nd homes located there. Referred to as “Vancouver’s Weekend Playground” by Seabright Farms, the largest developer of new custom cottages built on lots along the south beach shores, Point Roberts caters to those interested in getting away from it all for R & R and memorable outdoor activities and experiences. By Car: Point Roberts is located in Washington state, but to get there by car from the US requires 2 border crossings in Blaine and then again in Tsawwassen. By Air: There is a grass landing airport in Point Roberts that offers service by San Juan Airlines. By Sea: 48 degrees 58’ 23.91” N, 123 degrees 03’ 52.20” W / NOAA Chart 18241. As Point Roberts is located in Washington state, there are no border crossing requirements for those travelling from the US waterways. Point Roberts is an undiscovered gem that will be well worth the delivery to get there. Recognizing that border crossings might be challenging for some crew, and the venue may require a two-day boat delivery for some Seattle boats, there are plans in the works to address these concerns. Point Roberts Race Week will arrange for a water taxi to transfer walk on crew from Blaine Harbor Marina in Washington to Point Roberts Marina in Washington. This crossing through Semiahmoo and Boundary Bay is 12.7 NM, and will take approximately 20-30 minutes. There are hundreds of VRBO and Airbnb offerings in Point Roberts for crews looking for house shares. Plus, RV and tent camping will be available at the Point Roberts Marina and also at Lighthouse Park Campground, a full-service campground near the marina that will be reserved annually for Point Roberts Race Week participants. There are also several comfortable hotels nearby in Tsawwassen. 2019 marks the 37th year that Race Week has called Whidbey Island home. It was brought to life by Northwest Yachting magazine back in the early 80s and the traditions continued with Bob Ross and Stan Stanley, followed by Gary Stuntz and then Schelleen and Charley Rathkopf and now Schelleen Rathkopf. Whidbey Island Race Week has enjoyed many years of hospitality, support and engagement in the City of Oak Harbor. But the marina’s only lift has been broken for 2 years and the plans to address a solution won’t begin until the year 2024. 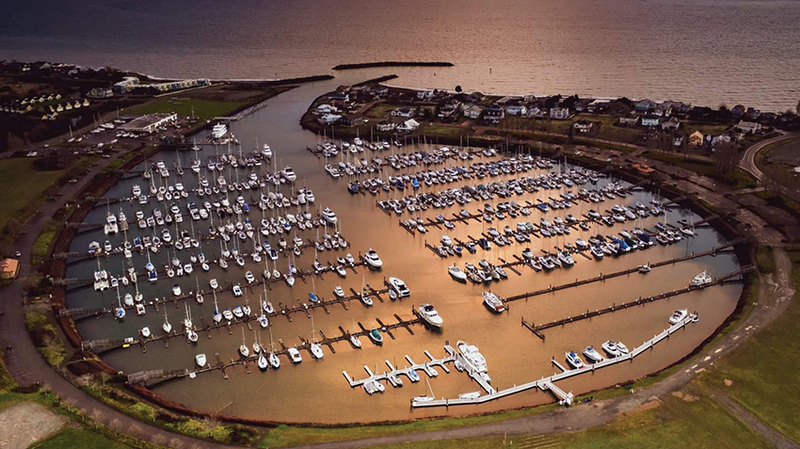 Additionally, the channel into the marina is in desperate need of dredging to accommodate larger boats that would like to attend Race Week but cannot due to their risks of running aground. In order to provide the best event experience on the west coast, attract boats from the US and Canada, expand our offerings to the region’s growing fleets, the event needs to be in a deep-water, full-service marina and unfortunately, that is not in Oak Harbor. The Oak Harbor Marina is owned by a tenant association (not the City of Oak Harbor) and the costs for the needed repairs and dredging is too cost prohibitive. Whidbey Island Race Week will celebrate its final event in Oak Harbor, Washington July 24-27, 2019. Whidbey Island Race Week will be rebranded as Point Roberts Race Week and additional information will be available on the new event website, PointRobertsRaceWeek.com that will launch July, 28, 2019. Registration for Point Roberts Race Week will open January 1, 2020. Schelleen Rathkopf is a Seattle native and grew up in a power boat family. She taught sailing at Malibu Club in Canada, a popular youth summer camp near Canada’s Princess Louisa Inlet during her summers in college. A graduate from Willamette University in Salem, Oregon, Schelleen majored in Art History and then pursued a career in marketing and promotions in Seattle area media houses including KING TV and Seattle Magazine for over 20 years. Schelleen served as the Sponsors Coordinator for the Mallory and Irvine Research Expedition on Mount Everest in 1999, where she worked on sponsor procurement and fulfillment on Mt. Everest. Schelleen has raced on a variety of boats including J24s, SJ24s, C & C 32, Olson 30, Cookson 12M, and a Star. She also owned and skippered her own boat, Isaura, a San Juan 28 for several years. From early 2000, Schelleen’s interests turned towards race management as this was a way to be involved with racing while raising two small children. For 16 years, Schelleen served on race committee as the scorekeeper and timekeeper at Corinthian Yacht Club in Seattle and also at Whidbey Island Race Week, prior to taking over ownership of Race Week in 2015. In addition to her work on Race Week, Schelleen is a certified professional organizer through NAPO (National Association of Productivity and Organizing Professionals) and in 2017, created her own home organization business, Stuffbusters of Puget Sound. She lives in the Ballard/Crown Hill neighborhood in Seattle with her two children. Theresa Coe, General Manager of the Point Roberts Marina, has been a resident of Point Roberts since 2008. She brings extensive management experience, a diverse background and a passion for boating to her position. She has worked in air traffic control in both Canada and the US, is a licensed PADI Dive Master and has been a volunteer member with the Canadian Coast Guard Auxiliary SAR team operating out of Point Roberts. She has a plethora of boating experience in both sail and power and bought her first boat at age 16 in Florida, where she taught herself how to sail. Theresa has raced lasers, catarmarans, and a 50’ Beneteau out of Davis Island Yacht Club in Florida and later raced a 31’ Evetts in the Pacific Northwest with the Deep Cove Yacht Club and Point Roberts Yacht Club. Currently, she enjoys boating on DevOcean, her Bayliner 38 that she keeps at the Point Roberts Marina. David Jackson has lived and raced in Point Roberts for 19 years and has a long history of sailboat racing since he was a young boy. He sailed sabot prams, lasers, fireballs and tornados before landing on his favorite big boat, Mad Dash – a Dash 34. Mad Dash has been in David’s family since 1984 when his parents and his sister (who were all on Olympic sailing teams) wanted a boat that the entire family could race and cruise on. His parents have since retired from racing, but David and his kids have continued the family tradition and have enjoyed a lot of success on the podium. As a longtime Whidbey Island Race Week racer (and the Overall Winner at Whidbey Island Race Week in 2018), David has also participated in club races, J24 Worlds and Vic-Maui.